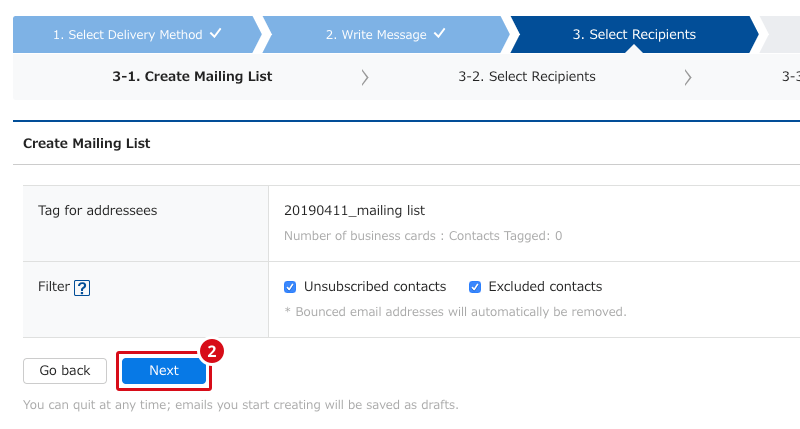 When you use the bulk email delivery function, you can send emails to multiple business cards at one time. This email will appear to the recipient as a personally written email. 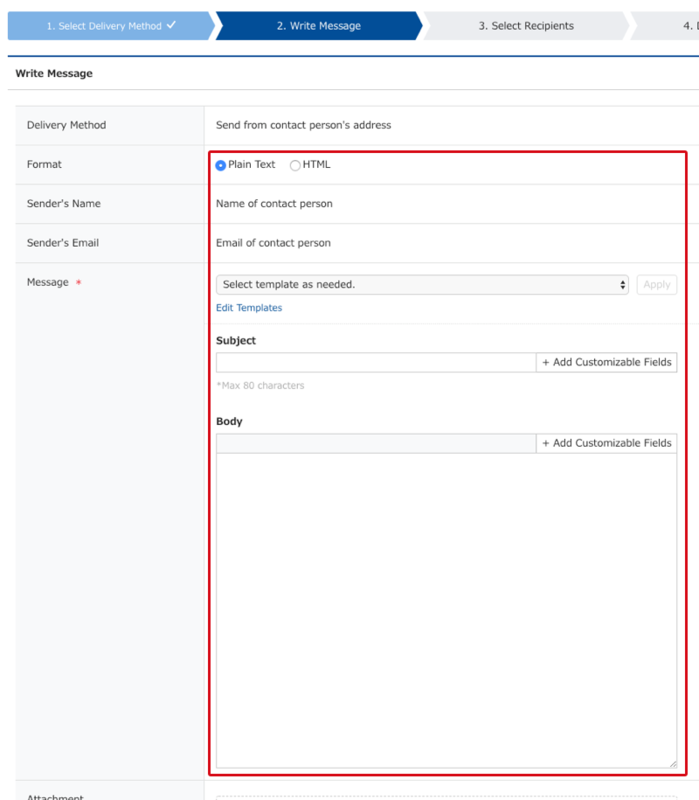 Here we will explain how to use the bulk email delivery function. To use this function, it is necessary to have permission for "Email delivery". For how to give permissions, see here. Tags are used to specify recipients. For each delivery, please specify a recipient tag for that delivery. You can delete tags you no longer need. For how to do this, see here. Only business cards which have finished being changed into data can have bulk email sent to them. You can use the Message function to check with your colleagues if there are any problems with the people you are sending to. Up to 100, 000 emails can be sent in one day. This is counted by the company contracted to use Sansan, not by individual users. * When the number of recipients reaches 100,000 in one day, you will no longer be able to make reservations for bulk emails on that day. Delivery can be canceled up to five minutes before the delivery time. Click on "Bulk Email", then on "Compose/Edit". 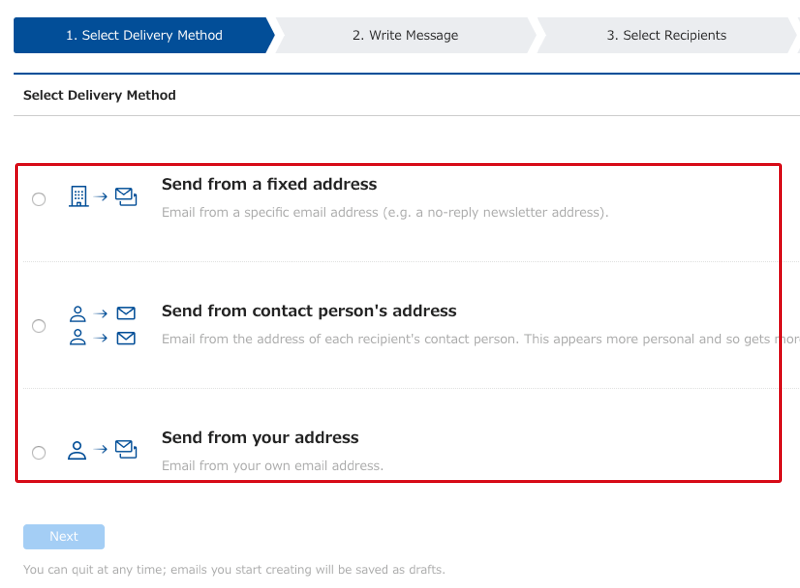 Choose either "Send from a fixed address", "Send from contact person’s address", or "Send from your address", and then click on "Next". Input the information for the sender name, the subject, and the body of the email. 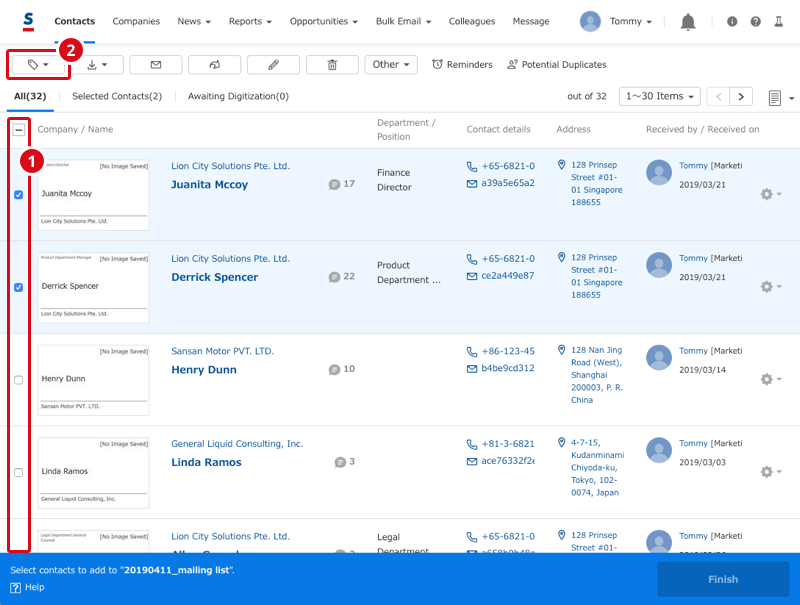 If necessary, use a template, customizable fields, file attachment, and the Test email sending function. * For how to do deliveries using HTML format, please see here. To specify what people the email will be delivered to, please create or specify a recipient tag. 1. 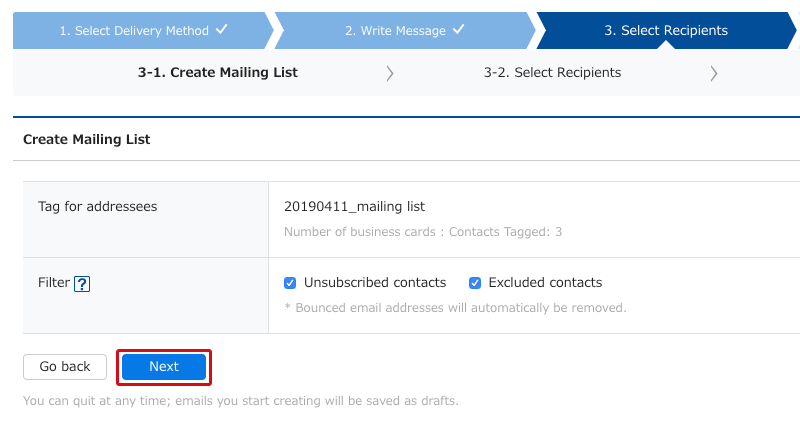 Create a tag to be attached to the business cards that will be the recipients of the emails. * The tag name by default will be "yyyymmdd_bulk email addresses". Please change it according to your needs. 2. Confirm that the recipient tag is correct, and then press "Next". 3. Press "Start attaching tags". This will bring you to the Business card management screen. 4. Attach tags to the business cards of the people you want to send the email to. ※For how to attach tags to business cards, see here. 5. After you have completed attaching tags, press the "Finish" button at the bottom of the screen, and then resume the delivery tasks. 1. Choose "Use existing tag"
2. From the pulldown below, choose the tag you wish to use for recipients, and then press "Select". *Any "Children tags" under the tag selected will not be included as recipients. If you wish to include the Children tags, please use the method here to bring the tags together, and then select this tag. 4. After checking that the recipient tag is OK, press "Next". 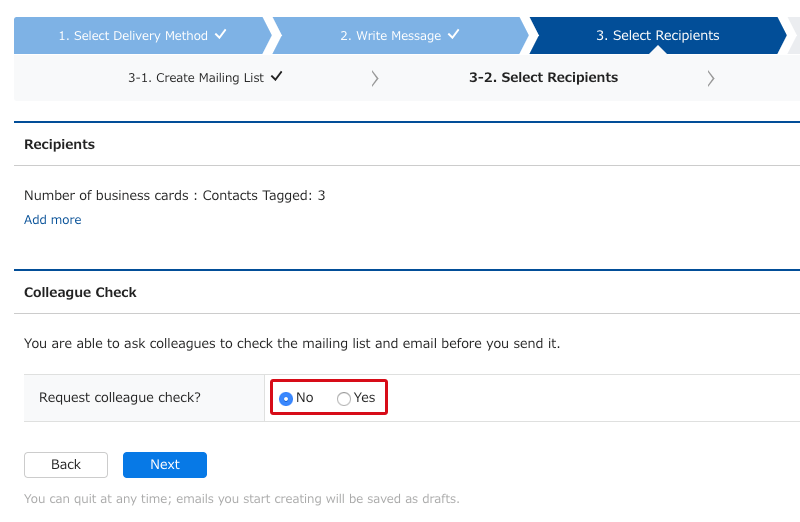 After completing the recipient tag selection and tag attachment, please select either "No(Do not request)" or "Yes(Request)" your colleagues to check the recipients, and then press "Next". *If you select "No(Do not request)", go ahead to "3-3. Final Check of Recipients". 1. Click on "Add message". After clicking on this, a pop-up will come up. 2. Please select the colleagues displayed in "Colleagues to request". Holders of recipient business cards are automatically added to this. 3. 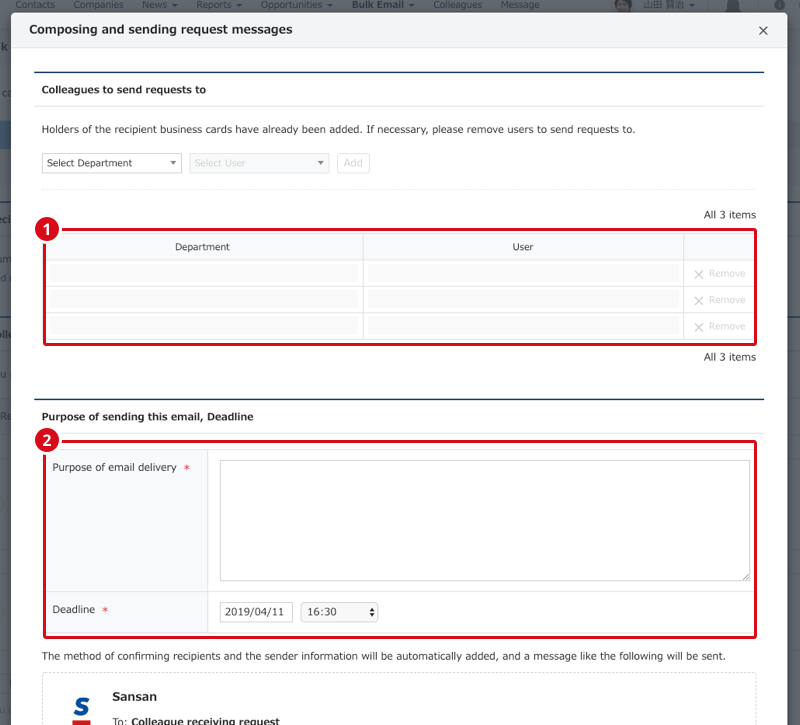 Then, enter the appropriate information into "Purpose of sending this email, deadline", and press "Send message" at the bottom of the screen. 4. After sending the requests, you can check your colleagues progress on this task from "Check colleagues' progress". When all of them have finished and the progress bar reaches 100%, press "Next". *From "See details", you can also select "Force completion" or "Return to incomplete". After checking if the addressees, senders, and sender signatures are correct, click on "Next". If necessary, use "Make corrections to contacts with invalid characters" and "Remove". *By using "Email Preview", you can see the email you are going to send with the inserted text inside it. You can select either "Send in 15 minutes" or "Specify date and time". After setting the delivery time, click on "Confirm". As a final check, please confirm the delivery information. If there is no problem, click "Save".